Today I went for a usual walk with my baby around our property. Eaton was mesmerized by the clear view of the ocean and green pastures all over us. I was happy seeing him in his own zone. Suddenly, when I was looking at the ocean Eaton said " I spy a pond". Yes, there was a pond very close to us so I quickly pointed to it and responded with a sentence "I spy a pink flower". Eaton pointed to a pink gardenia next to us. That's how we started "I spy..." game. Kids love doing it and it's a great opportunity to introduce new nouns and adjectives. When we came back to our garden I said "I spy an avocado tree". Eaton was looking around, but he didn't know what to point at. I shown him a baby avocado tree we recently planted. Until the nap time Eaton was saying "I spy an avocado tree" all the time. He loves that game. For the last few months I was shopping in thrift stores for all kinds of books. 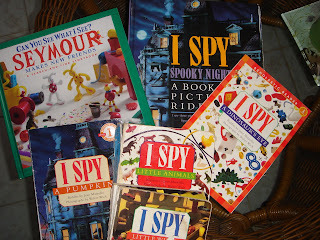 I found few "I spy" or books with a similar topic, each for $ 0.25, what a great deal! Try that game with your baby. Maybe he/she will love it.